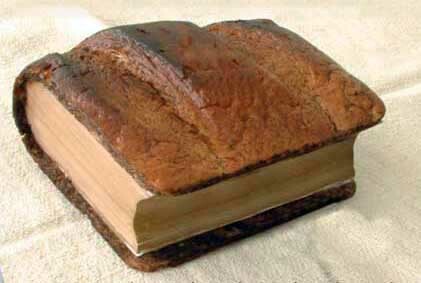 Is that a Bible made out of bread?! You know it, your spouse/flatmate/good friend knows it, your college roomie figures it's still true though they haven't seen you in years. So I won't be another person who beats that barely breathing horse: It would help to be reading your Bible daily. Let's get past that factoid. You open Genesis and begin. You're doing it! Then somewhere either when you grow noxious at the Bible's version of "Temptation Island" in Genesis 19 (but far more twisted), when you encounter the detailed architectural plans of God's temporary beach/desert house (5 straight chapters, which means 5 days of power-napping), or, one word, LEVITICUS, you give up. Okay, a new season is starting: What are you gonna do about it this time? (resist saying: "Read my favorite Psalms." Everyone is comforted by ice cream, but people don't grow from eating a steady diet of Cherry Garcia...just ask my kids). (1) Simple attitude adjustment. "Man cannot live on bread alone, but on every word that comes from the mouth of the LORD" (Deuteronomy 8:3). Every day we need bread for strength (or, if gluten-free, Rice Bread). Every day we need God's Word for strength to live for Jesus. Might I suggest that we take this one step further: That our Father is so intimately involved in our lives that whatever you read next in God's Word on a given morning (or evening), that is exactly the food you need. I have found this to, by and large, be true even if I don't realize it when I'm reading it. But each morning I make a conscious effort to wonder aloud: Lord, I wonder what you have cooked up for me today. This allows me to receive what He has to say much more readily. James 1:20 says this: "Get rid of all moral filth and the evil that is so prevalent, and humbly accept the word planted in you, which can save you." Each day God is planting His Word in your heart to deliver you, to strengthen you, to help you further depend on Him: Will you and I humbly accept what He's putting on our plate? 2) Staying in God's Word Daily requires Accountability. This can be accountability with others or just accountability before God. Bottom line: If you don't have a plan, it's ain't gonna happen. Here's a resource that I've found helpful in making, storing, & sticking to a plan: MyBiblePlans.com. Here you can Choose: (1) The Books of the Bible you wish to read (eg., John, 1 John, 2 John, 3 John); (2) The duration of time in which you wish to read them (eg., 2 weeks, 1 month, 3 months); (3) Store your plan online and/or print it out; (4) Read Your Daily Scripture Passage(s) in different formats: It can be sent to your Email Inbox each morning, sent as an RSS feed, it can even be sent in audio format. Stay accountably by making a plan & sticking to it. 3) Staying in God's Word Daily requires Interaction. At least I find it to be significantly helpful as interaction stimulates the mind and keeps us from distraction. Write down something about what you read that day. Could be a promise from the Scriptures, a sin you were convicted of and for which are receiving Christ's forgiveness, a prayer you felt led to pray in response to the reading. You could just write down one verse. For years, I kept notebooks full of a very, very simple & free online study. Starts with a "peak your interest" type of question, moves into questions for Study, 1 or 2 application questions and a final prayer. Did I mention it's free? And it covers any book of Scripture. IV Press Online Bible Studies. After you click on the link, in the URL after the final backslash (/) type in the book of the Bible you wish to study. (Ex: ivpress.com/bible/john). Be flexible and try a couple times -- for Philippians, type in phil; for Leviticus, type in lev; for 1 Corinthians, type in 1cor. May God strengthen and grow you with the food he puts on your plate.